Where does my creativity come from? I get asked this question often as a designer. I love everything creative and coming up with new ideas is so exciting. It’s that, “Aha!” moment that I live for. But where does it come from? How do I get there? 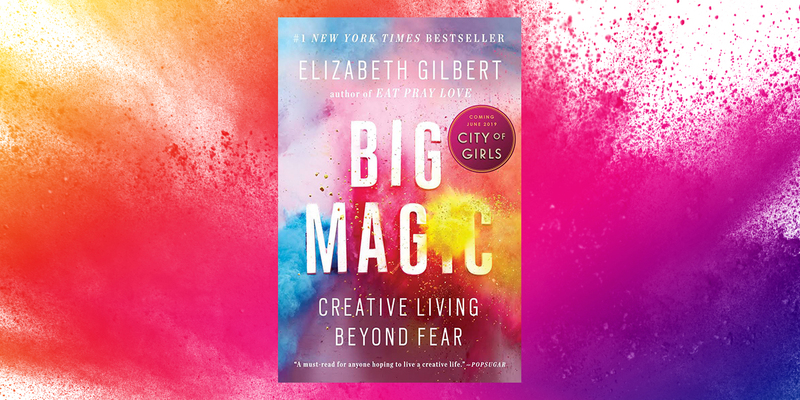 I recently stumbled upon, Big Magic by Elizabeth Gilbert. Gilbert brings ideas to life and explains ideas as if they are another species— right alongside plants, animals, bacteria, and viruses. They interact with us through consciousness and the only way an idea may come to life is through a human partner. They’re constantly swirling around us, just waiting to be recognized in the midst of our distractions, anxieties, and every day hustle and bustle. When you are relaxed and least expect it – BAM! – an idea arrives. Don’t take too long, an idea may decide to leave you at any given time. Or perhaps you decide to reject the idea and it will then move on to someone else. This happens all the time. You pass a billboard that has your idea, a brochure with your layout, a logo you had in mind… all a spark of inspiration you didn’t have time for that moved on to someone else who had the time. Living curiously is a sure way to bring about an idea. You can be curious about the simplest of things. Don’t live behind fear as many creatives do. To know your own capacity and have in-depth knowledge of the world around you, you must be brave and courageous. “It seems to me that the less I fight my fear, the less it fights back. If I can relax, fear relaxes, too.” Many fear they aren’t good enough, won’t make enough money, won’t live up to their own expectations. Don’t hold back because of fear, understand it, but don’t be fearless. Fear and creativity must coexist—kill one, you kill the other. Gilbert explains how the Romans believed that exceptionally gifted people were not geniuses, but rather had a genius. By accepting that you have a genius, you protect yourself from both shame and praise. To label one as a genius is a disservice as it makes you lose the ability to create freely and enjoy your work. You have to be able to let your creativity come and go. My inner genius definitely works on his own schedule that is far different than my daily routine. He shows up randomly: in the middle of the night, early in the morning, while driving, cooking, watching kids, he’s everywhere when I’m least ready. Hence, the notebook by the bedside, notes in the phone, email reminders, sticky notes, napkin notes, and a stash of pens everywhere. Creativity is more of a gift to the creator than it is to the audience. It’s a feeling of accomplishment when you bring an idea to life. We are all made to create and there are a multitude of platforms to be creative— storyteller, builder, musician, explorer, tinkerer, problem-solvers… you do not need to wait for permission to be creative! Nicole is an integral part of RCP’s creative team that continually creates fresh design concepts for RCP's clients and has created marketing pieces that have won national awards for design.